Whittle away a day in the woods, creating your own spoon! This 1 day workshop will take you through the whole process, from branch to spoon. Suitable for anyone aged 14 years plus (under 18 need to be accompanied by an adult). Developing your grounds for learning? Louise is an accredited trainer and facilitator for Learning through Landscapes (LTL) and can provide tailored support for your ground project. Please contact us for details. The natural world can be a great place to de-stress and build professional relationships. 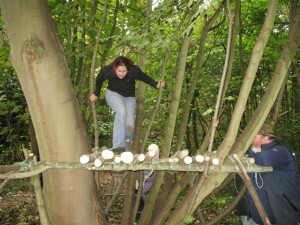 We can provide stimulating and challenging days designed to develop communication and group skills.